MEGABYTE has won the National champion and is the new Heavy Weight Champion.!!! Pictures from the latest megabyte's championship win in Minnesota at the TSN nationals are here -- click to see pictures. Sept 9, 2003 MEGABYTE is declared the new National Heayweight Champion at the triangle series national in Minnesota. egabyte is the RFL national Champion in the Heavyweight (220 Pound) weight class. MB came out of the tournament undefeated and un-damaged. We KO'd 3 and won one by a decision. It took 4 fights to get through all the champions in the country. The final and semi-final we against 2 very tough bots the we destroyed in less than 2 minutes. July 2003 Our new lightweight Kill-a-byte takes first place in North Carolina. Rambite takes 3rd place at Steel Conflict II robot rumble, Aug 23-25, 2002. A large collection of our Steel Conflict photos is here. Video of all Rambite 3.0's battles at steel conflict can be found on the STFU productions site, linked to below. 02.08.25 Rambite 3.0 in its new shell, spinning like Gamera takes 3rd place at Steel Conflict. Click here for pictures of Rambite and the other bots in the pit. 02.08.19 Rambite 3.0 is born. Its frame has been straightened out. More voltage. More torque. And best of all, a new weapon: hardened tool steel blades on a new rigid spinning shell,. Rambite is now like a lightweight Mauler51-50 or a "frisbee"
02.08.11 Rambite is completely torn-down for rebuild. Its making its return as a pot-like spinning shell. New electronics, more batteries and improved stability. She is in her best form ever for the Southern California Steel Conflict, this month in Pomona. 02.05.19-27 Battlebots 5.0: click here for Blow-by blow battle reports from Battle bots Season 5.0, May 19-27, This is password protected for friends and family only, as the actual battle results are under NDA with Battlebots. 02.05.15 Rambite 2.0 is seeded, and scheduled for battle in the finals. 02.05.03 RDC Demo'ed the improved RAMBITE 2.0 at the Del Mar Electronics show 5-1 & 5-2 and had MEGABITE in one of our sponsors booths. We had a chance to spin RAMBITE 2.0 up and hit some solid concrete barriers and the concrete barriers lost. Chunks of concrete flew and RAMBITE survived and stayed stable. Hopefully no one we fight will be as solid as the immovable concrete wall. 02.04.12 RDC has a new Sponsor. The Del Mare Electronics Show. See Sponsors for more info. 02.03.28 Boards for the Ultimate Robot Motor Controller (URMC) have gone to FAB. 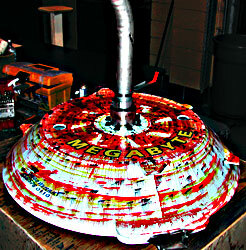 RDC has selected MEGABITE as the name for the new heavyweight. RDC is making MAJOR upgrade to RAMBITE and the upgrades are 90% complete.